The years following the 2008 financial crisis have been difficult for those who adhere to the vision of society articulated by Adam Smith. The success of Thomas Piketty’s Capital in the Twenty-first Century shows how criticizing the theoretical justifications of the free market has become more fashionable in academic and elite circles than at any time since the end of the Cold War. And the scope of the Obama administration’s expansion of spending and government control over the economy has been truly alarming. In part as a response to these increasingly serious attacks on free enterprise, the American right has shown new interest in libertarianism, as can be seen in the success of politicians like Rand Paul. These libertarians defend a vision of society with a small government and a free economy by appealing to the principle that individuals should be as free as possible from government coercion and taxation, or by pointing to the fantastic economic productivity of the free market and criticizing the inefficiency of Big Government. These are important and valid arguments, but they do not speak to what Irving Kristol described as the third promise of capitalism: "the promise that, amidst this prosperity and liberty, the individual could satisfy his instinct for self-perfection—for leading a virtuous life that satisfied the demands of his spirit." This moral promise was in fact a crucial part of the original case for a classically liberal society made by 18th century philosophers like Adam Smith. As Yuval Levin reminds usin his 2010 essay "Recovering the Case for Capitalism," Smith was a moral philosopher before he was an economist, and his economic theory was "one element of his larger project for the direction of human passions and appetites." Smith’s moral philosophy, found in his first book, The Theory of Moral Sentiments, was one that emphasized the moderate, or bourgeois virtues, — "prudence, restraint, industry, frugality, sobriety, honesty, civility, and reliability" — virtues that are built into men and women by "the experience of life in society, and the modest sympathy and conscience that develop through that experience." Defending our classically liberal political and social order against progressivism requires not only arguments against government coercion and for a productive free economy, but also a case for social institutions that can channel our passions of self-regard toward decency, restraint, and the middling virtues of a bourgeois society. These institutions, which include the market, but also the family and religious traditions, have been undermined for years not only by liberal partisans of economic equality, but also by the advocates of unrestrained individual liberty. Indeed, some of the free market’s most vociferous defenders, like the disciples of Ayn Rand, have perhaps done more than anyone to undermine capitalism’s moral promise. The need for wider recognition of the moral foundations of a liberal capitalist society makes Russ Roberts’ How Adam Smith Can Change Your Life: An Unexpected Guide to Human Nature and Happiness an important and timely book. Roberts, an economist well known for his EconTalk podcast and his many books and writings dedicated to bringing the ideas of economists to as wide an audience as possible, has written with this slim volume a lovely and accessible companion to Smith’s Theory of Moral Sentiments that will hopefully be read by many of the libertarian-oriented conservatives in his audience. The book is not intended as a defense of Smith’s broader philosophy, and aside from a few instances, Roberts does not dwell on criticizing or lamenting our culture’s growing individualism and moral decadence. Rather, Roberts presents Smith’s moral teaching in the genial form of an advice book, with each of the chapters helpfully classified and organized as guides for "how to" achieve various worthwhile aims. An advice book is perhaps not the best form for conveying all the intricate details of Smith’s philosophy. And for Smith, moral improvement comes from the long-term education of the sentiments by properly formed social institutions, rather than instruction in the form of advice or propositions. But while turning Smith’s complex moral philosophy into concrete advice for modern readers may not convey all the sharpness of the philosophical problems Smith was concerned with, it does help make Smith’s general insights more accessible to the reader. For a serious student of moral philosophy, there is of course no replacement for reading Smith’s book (which, as Roberts points out, is available either for free online at EconLib.org, and an excellent edition of the text is published by the Liberty Fund) but Roberts does a good job of providing those who do not have time to dedicate to studying the original with some of the most important of Smith’s insights. And for those who have read or who are planning to read Smith’s Theory of Moral Sentiments, the helpful modern examples Roberts uses to illustrate some of Smith’s concepts makes it a valuable and accessible companion to Smith’s book. The best part of Roberts’ book, where he presents the most important elements of Smith’s moral philosophy, are the two central chapters: "How to Be Loved" and "How to Be Lovely." Being loved and being lovely means earning "respect and honor and admiration honestly." To do this, we must be genuinely concerned with how we will appear to others in society. Smith’s name for acting in a way that others can approve of "propriety," or, as Roberts describes it, "meeting the expectations of those around us." Though Smith believed propriety was important, he recognized that there are many cases when society approves of the actions not of the wise and virtuous, but of the rich and famous. Partly for this reason, many people today see scrupulously appropriate behavior as mere vanity or hypocrisy, leading to what Roberts describes as our culture’s "almost iconic respect for certain kinds of impropriety." (120 emphasis in original) For Smith, however, the solution to the problems of vanity and the undue admiration we give to the rich and famous is not for not for people to be "true to themselves" but rather to be truly respectable. Being truly respectable, or being "lovely," as Roberts puts it, is a responsibility we all have for ourselves. But, as Roberts observes, we are made virtuous less through exhortation or the deliberate intentions of governments or philosophers, but "through the signals of approval and disapproval we send to each other and through the admonitions we give to our children." The institutions most essential making people virtuous are not government agencies that impose universal standards of justice, but spaces like the free market and civil society groups where people are able to judge one another’s actions. There is one part of the book where Roberts’ discussion of contemporary issues unfortunately leads him astray from Smith’s argument. In the chapter "How Not to Fool Yourself," Roberts begins by presenting Smith’s teaching on self-deception, a small but important element in Smith’s moral philosophy. The evils of self-deception are an important, but relatively small part of Smith’s book. He would have done better to replace this chapter on self-deceit with one on "How to Be Disciplined" treating Smith’s very important discussion of the virtue of self-command, which, Smith writes, is "not only itself a great virtue, but from it all the other virtues seem to derive their principal lustre." Indeed, a serious discussion of self-command is conspicuous by its absence from Roberts’ book. Roberts’ account of Smith on self-deceit begins promisingly enough, as he rightly observes that people are likely to deceive themselves about the propriety of their actions because our passions, self-interests, and desires often get in the way of our ability to make sound moral judgments. Even when we reflect on our actions later, an "honest assessment of our behavior is often too hard to bear." (58) Roberts is also right to note how we are often too lax about moral self-deception today, believing as we do that that "confidence even if it’s overstated can be beneficial" (60). Roberts goes wrong, however, when he tries to bring Smith’s insights about moral self-deception to bear on contemporary discussions of limits of human reason, such as the idea of "confirmation bias." Confirmation bias, which has been a very fashionable research area for behavioral economists and psychologists in recent decades refers to the way we ignore evidence that refutes our beliefs while "eagerly accepting evidence that confirms what we believe." Roberts correctly observes that this is a serious problem for his own field of economics, where "Keynesians just know that Obama’s stimulus package created millions of jobs" though both Keynesians and their critics can both point to data and studies that seem to prove their contradictory claims. The limits of scientific rationality, especially in disciplines like economics, is of course very important. Smith himself recognized the limits of reason, and one of the crucial goals of his book is to show how morality is founded on the sentiments and their education by social institutions, rather than on reason and the rules formulated by philosophers. But we should not try to understand Smith better than he understood himself, and that is just what Roberts is doing when he writes "that the challenge of seeing ourselves honestly extends beyond our interpersonal relationships" and that Smith "may be underestimating the damage" of self-deceit. Unlike the contemporary ideas about "confirmation bias" and the "narrative fallacy" that Roberts cites, Smith’s discussion of self-deceit concerns not just any sort of beliefs but specifically "our own judgments concerning the propriety of our own conduct." Consider, for instance, Smith’s description of a situation where self-deceit would be impossible: "If we saw ourselves in the light in which others see us, or in which they would see us if they knew all, a reformation would generally be unavoidable." Smith did not believe this could happen, but it is plausible that we would never act against common moral standards — never steal or cheat or lie — if we truly saw ourselves impartially, as others would see us. But if Paul Krugman saw himself in the light in which Grover Norquist saw him, it seems no more likely that he would reform his views than Norquist would be if he saw himself in the light in which Krugman saw him. Likewise, what Smith reasonably sees as the natural remedy for moral self-deceit — following general rules that are formed by our continual observations of the conduct and judgments of others —would be of little use for correcting confirmation bias or the other limitations of our reason. There are hardly any useful general rules for how to draw conclusions from evidence, and if there were, they certainly would not be formed insensibly by observing what the rest of society praises or condemns. Indeed, our tendency to insensibly form general rules on the basis of stray observations, rather than forming beliefs on the basis of more systematic and critical inquiry seems to be an important aspect of problems like confirmation bias. Smith’s focus on self-deceit as a moral rather than an intellectual phenomenon reflects an important aspect of his broader project to ground morality in our sentiments and passions and their cultivation, rather than in rules formulated by reason. This approach to moral philosophy has much to recommend it for our age, especially for combatting the prevalence of shallow rationalist understandings of morality and technocratic approaches to government. But the sound advice that our reason has its limits when it comes to morality has its own limits that need to be recognized. By limiting the role for rational reflection on moral questions, Smith’s philosophy is less helpful to help us settle vexing moral questions like whether our society should permit abortion. Despite the limits of Smith’s philosophy, by turning our attention to the importance of social norms for cultivating the moral sentiments, The Theory of Moral Sentiments can help us understand how we can all live more decent and virtuous lives in the modern world. 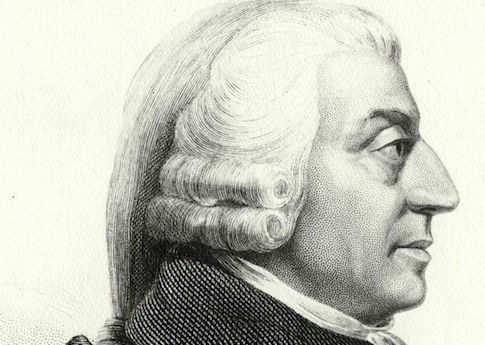 How Adam Smith Can Change Your Life, by turning the attention of libertarian readers toward Smith’s moral philosophy, can be a useful step toward a recovery of the understanding of morality on which modern society rests. Brendan P. Foht is assistant editor at The New Atlantis: A Journal of Technology and Society.